"Jacopo Pontormo’s work at Christopher Bishop Fine Art was quite impressive. Pontormo’s double-sided drawings represent four key scenes depicted in paintings that once occupied a loggia (a covered exterior gallery) at Villa Castello and which were lost after the Medici dynasty ended. According to Bishop, the drawings represent complex interconnected mythological narratives that dovetailed with the realpolitik intrigue of Cosimo I, who assumed the Ducal throne of Tuscany as a teenager to continue the reign of the Medici family after the assassination of a cousin, Alessandro." 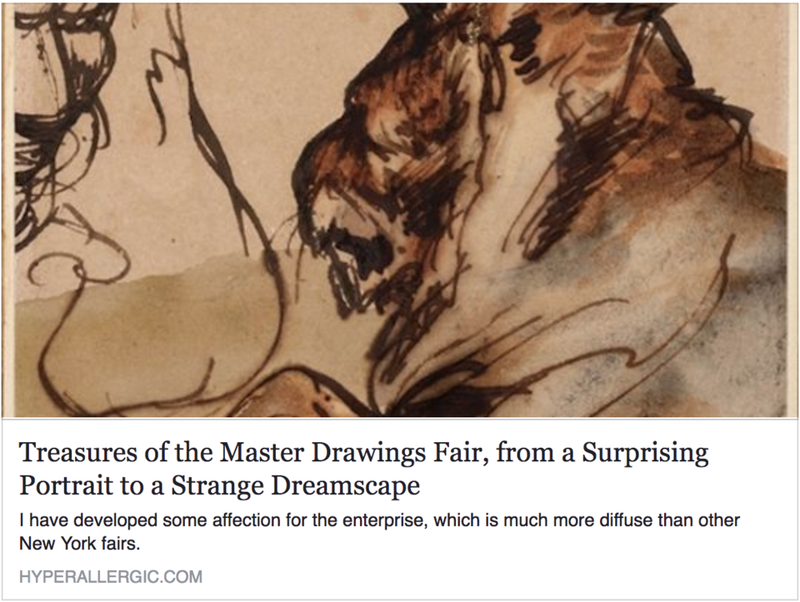 "In his presentation of the work, Bishop has artfully re-created the fresco, printing facsimiles of the four drawings on a gossamer shim mounted on the ceiling of his exhibition space. Surrounding it is a suite of didactic materials that explain in detail his recent scholarly dive into divination and dynasty building in Renaissance Italy." To download a pdf click here.